The Renaissance period in Western European culture is generally recognized as very roughly spanning the years between 1400 and 1600. 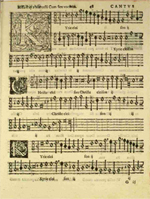 The sacred music composed during this period was written for the Roman Catholic Church. Much of this great body of music has survived today in manuscripts that were used in the great cathedrals and monasteries of Europe. Some instruments may have been employed, but the music was written primarily for a cappella choir (without instruments). Basically, Renaissance sacred music was an extension of Gregorian chant, a style of music that was also unaccompanied by instruments. The texts were the same that were used in Gregorian chant: the Roman liturgy, sung in Latin. The great composers of the early Renaissance were Guillaume Dufay (c.1400-1474), Johannes Ockeghem (c.1410-1497), Jacob Obrecht (1457-1505), and Josquin des Prez (c.1440-1521). Many glorious Masses and motets (which were short liturgical compositions) have come down to us from these great composers. 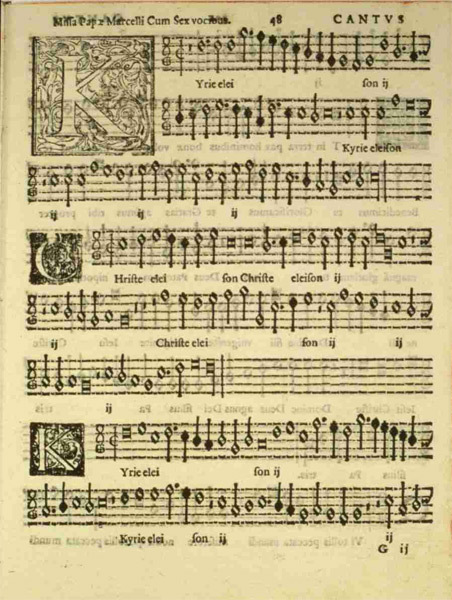 Second Book of Masses by Giovanni de Palestrina, 1567 From the Vatican Library. Click here or on image for larger view. The great composers of the late Renaissance were Orlando de Lasso (also known as Orlandus Lassus) (1532-1594), Jacob Handl (also known as Jacobus Gallus) (1550-1591), Giovanni Pierluigi da Palestrina (1525-1594), and Tomas de Luis de Victoria (1548-1611). These composers left a large body of works that are truly a great treasure of Western civilization; however, Western civilization does not know it. For this reason, there are few books and few web links. There have been a number of fine CDs produced, which, in the final analysis, is the most important tribute that can be made to this music. In about 1600, the baroque era began and the style of music changed dramatically. The baroque era was followed by the romantic era that lasted roughly until the beginning of the 20th Century. Today many listeners of Western classical music do not recognize Renaissance sacred music as being a valid classical music tradition. Music, supposedly, began with J. S. Bach, or perhaps earlier with the 17th Century composer, Claudio Monteverdi. This tremendous oversight can be brought into clearer perspective when one realizes that just over a hundred years ago, listeners in Europe were largely unfamiliar even with the music of Bach. The style of the great sacred music of the Renaissance period is tremendously out of sync with contemporary culture. A music that has no instruments and, according to the average and casual listener, a music without any distinctive character, would be no match to the electronically enhanced sounds of contemporary music. However, Renaissance sacred music has much to offer to those who have realized the limitations of much of today's music and are ready to move on. Once one has become intimately familiar with the sacred music of the Renaissance, it becomes obvious that this is a period of musical culture that should have never been forgotten and neglected by contemporary society. 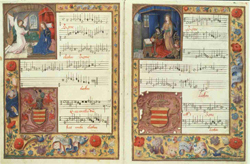 Missa de Beate Virginie by Josqui des Pres From the Vatican Library. Click on image for larger view. 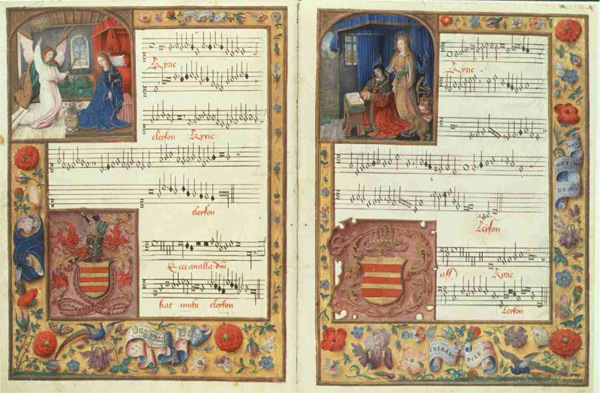 The world has yet to discover the lost music of the Renaissance. When this music is finally accepted by spiritually minded souls of all nationalities and cultures, it will be a great day. What a treasure this music is, buried in the back shelves of our larger university libraries.Da Vinci, Rafael, Michelangelo ... a dozen or so artists are recognized as great masters during the time of the Italian Renaissance. Why has not the same recognition been afforded the composers that were also great masters of Renaissance art during the same period? A music so pure, so spiritual, so connected, so calm, that mere words cannot explain it. Its essence is a rare, refined celestial beauty that resonates within the listener to such an extent that the presence of angels is felt, and the spirit of the divine is sensed, all with a magnificently peaceful grandeur. If I had but only one composer to listen to on a remote island for the rest of my life, that composer would be Tomas Luis de Victoria.